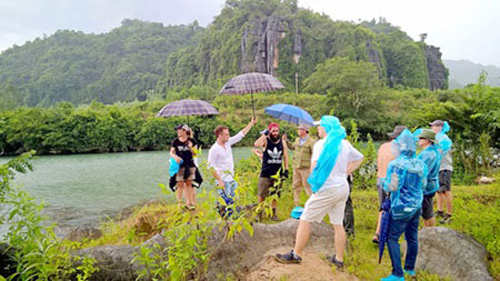 VietNamNet Bridge – The Ministry of Culture, Sports and Tourism has said that the Kong: Skull Island film crew has completed its survey in Vietnam to start shooting the film in Vietnam in February. Director Jordan Vogt-Roberts (third from left) and his team in Hoa Binh Province, Vietnam in September 2015. Photo: Legendary Pictures. Legendary Pictures plans to shoot at some famous tourist sites in Vietnam in February. 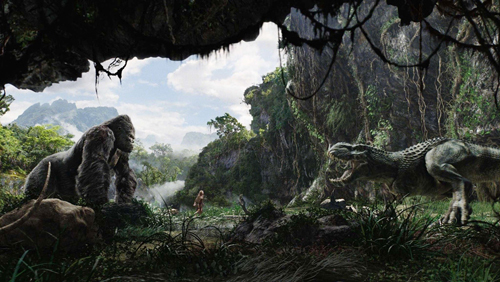 In the movie, Vietnam is the hometown of the giant apes. The places that will appear in the film are the world’s largest cave Son Doong in central Vietnam, the world natural heritage site Ha Long Bay and Ninh Binh in northern Vietnam. Along with the movie “Pan”, “Kong: Skull Island” is considered an opportunity to promote the country and people of Vietnam in Hollywood movies. Moreover, Vietnamese film-makers can learn experience from Hollywood colleagues. Kong: Skull Island is the second part of the blockbuster King Kong, which earned US$550 million in 2005 and the third part of a series of movies about monsters of Legendary Pictures and Warner Bros, after King Kong (2005) and Godzilla (2014). The movie is the story about a group of explorers who go into the jungle to discover the birthplace of the lord of giant apes. The movie stars actors Brie Larson, Tom Hiddleston, Brie Larson, John C. Reilly, Samuel L. Jackson and Toby Kebbell and is directed by Vogt-Roberts. The film is expected to be released in 2017. In his mid-30s, Vogt-Roberts made his directorial debut with the film The Kings of Summer at the 2013 Sundance Film Festival, where it was nominated for the Grand Jury Prize. It was also screened at the 2013 Cleveland International Film Festival. It won the Narrative Feature Audience Award at the 2013 Dallas International Film Festival. Vogt-Roberts also co-wrote and directed the TV series Mash up.